We are full-on in "Fiesta prep" mode here at Creative Accents... our back table goes from clean to covered in less than 60 seconds (roughly. heehee!) 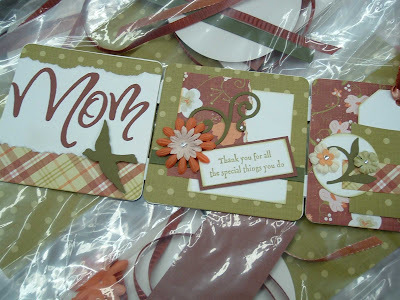 as we pack goodie bags, finish up project samples, cut paper & bag embellishments for class kits! This photo is a sneak peek at the mini book class project Rena designed (and the bags of class kits underneath it!) for the day! Our remaining tickets are selling quickly, so if you are wanting to come and haven't bought yours yet, you'll want to do so quickly! Excitement is building... it's gonna be fabulous! Tickets are just $50 (which includes a donation to the Relay for Life). Click on the label button at the bottom of this message for more details!